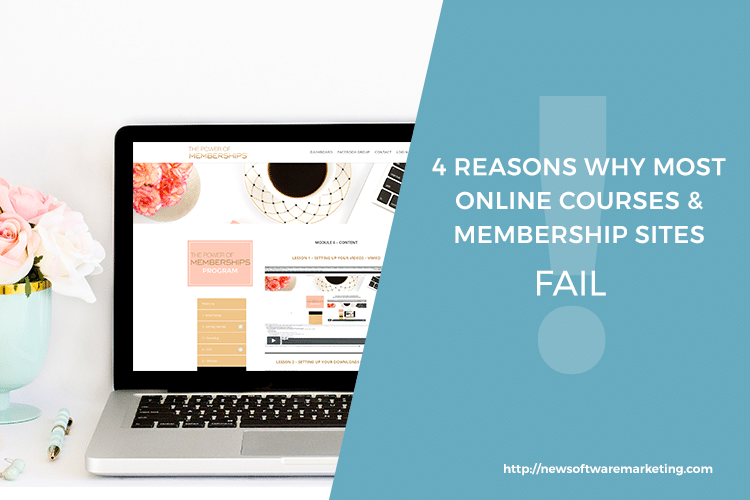 So, let’s talk about the four reasons why an online course or a membership will fail. This is what happens to most online courses that people release out there. There are actually very few that are successful. So, reason number one is poor planning. A lot of people think that you can just record a couple of videos, put that on a website, protect that with a login/password and then call it an online course. You really have to treat your online course and membership site like a real project and it has many components. You need to think about what you are going to be solving. Because you’re not selling an online course or membership site. You’re selling a solution to a problem. You need to make sure that you know who are selling it to so that you can have the proper message. There is the whole technology part, what are you going to use to record your videos if you do videos, audios. Are you going to have supporting material like PDFs, worksheets, checklists. You’re going to need a sales page. Are you going to hire a copywriter? Are you going to write your own copy? There are a lot of things that need to happen in order for an online course or membership site to be successful. You really have to take this as a serious big project that you have to break down into smaller chunks and just put that on your calendar so that every piece can be done and then you can actually have a date where you’re confident you can actually launch the thing. Then people dive in and they start working on content and copy and shooting videos and things like that without validating the idea first. Because it could be, it could sound a good idea to you but the format, the length, how you’re going to teach it, it can really make or break your online course or membership site. Validating your idea is critical. There are actually three factors that you need to look at to validate it. One, it needs to solve a real problem. It needs to be a solution to a problem. The outcome, the transformation needs to be really, really clear. If there is like the situation they are in now, there is the solution which is your online course or membership site that is going to get them to where they want to be. So that is the before and after. That’s the transformation that you’re selling, okay? So that’s the first criteria. The second criteria that you need to look at is are people willing to pay for it? Because there could be some solutions that people would find really cool but if they are not willing to pay for it or they can’t, then basically it’s going to be a viable online course or membership site for you. Finally number three, you need to be able to teach it. In other words, it needs to be something that you’re proficient in so you actually know the stuff and you can teach it. An example would be I created my own website and it was super easy, so I’m going to teach people how to build a website. The chances that this is going to work are very, very slim, okay? So you really need to know your stuff. Those are the three criteria to validate your idea. Once you know that, there is actually something that you can do to actually validate this idea before you even get started building the big thing is to run what we call a pilot program or a beta program. What it is it’s basically running this teaching on a set number of people, sometimes some people do five, some people do 10, some people do 50, and they are basically going to get a lot of extra [inaudible 00:04:27] from you and in exchange they’re going to provide you feedbacks on the content of the course, on how it’s being delivered, how it’s being viewed. They’re going to tell you if this spot was too much, if it should be broken down, if they need extra resources and things like that. The goal of the pilot or beta program is to really iron out the details, make it really the best course that it can be and you are going to have to have people go through the course so that they can actually tell you. You can try to guess what people want, like ultimately if you let people tell you, then you will be able to create a course that’s really, really successful, okay? So run the beta program after you validated the idea. You talk to people, you survey them. You talk to your one-on-one clients if you have them. Run the idea on a pilot program and that’s something that you can set up pretty quickly. We do real pilot programs for our clients and we set those up in one week, so it’s actually pretty easy to have a working stable platform where you can accept payment, deliver an online course pretty quickly so that you can quickly get feedbacks and other ideas if that’s something that you even want to turn into a bigger course. Reason number three is not knowing how to teach it. You might have the knowledge but teaching one-on-one in-person or to a group in-person is very different than teaching online. You really have to imagine the person being sitting in front of their computer alone in front of the screen. You have to make your content engaging, not overwhelming, break it down into pieces but at the same time helping them figure out what is the next step for them, providing extra resources for people that might need a little help in certain areas and making it fun. Giving the opportunity for people to be able to engage inside a platform so they can ask questions, they can talk to each other. Maybe you can have some type of accountability program where people can pair in groups of two or three and go through the course together. There are all things that are going to help people go through your course and get results, because it feels very lonely when you’re alone in front of your computer. Being conscious that you will need to teach this differently than you’ve been doing it one-on-one is really critical. Then reason number four is content overwhelm. There is actually such a thing as too much content, you know, like 30, 40, 50 hours of videos. Who wants to go through that? Actually less is better. Concise, to the point, breaking it down your online course or your material into bite-sized pieces that people can consume easily, with a clear call to action and result at the end so that they can really feel like they’ve accomplished something and in they went one step ahead in their process is very critical. That’s really what’s going to give them the motivation to keep going inside your online course or membership. So content overwhelm, less is more, we talked about that. Concise and to the point, and don’t hesitate to create extra resources like a resource library. I see courses sometimes that have tons of videos and the person tells me like, “This is because in case they don’t know how to do this or to do that.” I would take that out of the course and put that in an extra library so that for people that have some weaknesses in certain areas, then they can go in and check the library to get maybe a deeper training on something specific that is going to help them go through the course. The way you are going to break down your content, organize your content, help them find where they should go next, where they stop so progress tracking is really also really important but also where they’re going to get support. If you have a form or if you have a Facebook group, a private Facebook group, link it in several places so that people can just in one click can get to the support group and ask a question. That is really, really critical because many people just give up because they feel lonely. They get stuck and if it’s not easy for them to find where to ask for help, they’re just going to give up and go on and do something else. That’s not what you want, right? These are basically the four reasons why most online courses and membership sites fail, so let me recap. The first one was poor planning. You actually have to treat this as a real project. Break it down into smaller projects that you have to make happen, so the actual creation of the course but there is the whole marketing aspect. There is the whole technical aspect. What kind of platform are you going to use? How are you going to create your content? What are you going to use to do your videos? If you’re going to do videos, are you going to edit them yourself? Are you going to hire somebody to edit them? Do you need a copywriter? Do you need a designer? Are you going to get some graphics done, some PDFs, and things like that? There is a lot of things that need to happen when you’re building an online course or membership site, okay? It just doesn’t come down to doing a couple of videos and calling it an online course. Reason number two was to validate your idea. Remember it needs to be something that you know how to teach, that you know well how to teach, something that people are willing to pay for, and something that really solves a problem that people have. So it needs to have these three criteria. Reason number three was to know how to teach, and that is basically to break down your content in bite-sized pieces, provide extra resources and handholding, provide support, maybe an accountability program so that people can decide to go through the course together because it feels pretty lonely in front of your computer. And just making sure that they can get some type of result along the way so they will see progress and they will be motivated to keep going. Then finally, fourth reason, last reason was content overwhelm. It’s one of this case where more is not better, okay? Less is actually better because you don’t want to overwhelm them with hours and hours of videos or PDFs to watch. You have to be concise an to the point because people are busy and their attention span, as you know, is getting lower and lower, so you really have to capture their attention and get them straight to the point, straight to the result. Finally, provide them support in the community so that they don’t feel alone. They can get accountability but they can get also support from you and from their peers so that they don’t feel lonely, okay? So those are my four reasons. I hope you enjoyed this video. If you are running a course or a membership site or are planning to and you have any questions, please post them in the comments below and I will be happy to answer them as I see them. Thank you so much for watching and I will see you next time.